If geoengineering were ever used, it would not simply be a case of 'turning it on' and leaving it to work. The amount and location of any geoengineering would have to be decided upon continually, and would depend on how the climate was changing in response to it, how much mitigation and adaptation was being undertaken, and what the target climate was agreed to be. This research - led by the Universities of Lancaster, Leeds and Bristol - has produced many insights into what the challenges associated with decision-making for geoengineering could be in the real-world. These insights are presented in Briefing Note 3. Jarvis AJ, Leedal DT, Hewitt CN. "Climate-society feedbacks and the avoidance of dangerous climate change." Nature Climate Change. 2012. Jarvis AJ, Leedal DT. 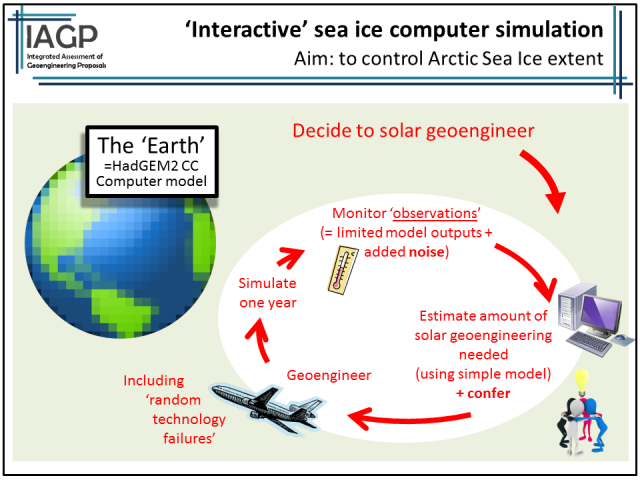 "The Geoengineering Model Intercomparison Project (GeoMIP): a control perspective." Atmospheric Science Letters. 2012;13(3):157-163. Irvine PJ, Ridgwell A, Lunt DJ. "Climatic effects of surface albedo geoengineering." Journal of Geophysical Research. 2011;116, D24112. Ridgwell A, Rodengen TJ, Kohfeld KE. "Geographical variations in the effectiveness and side effects of deep ocean carbon sequestration." Geophysical Research Letters. 2011;38, L17610.